Countertops: Quartz vs Granite, Which One is Best? If your kitchen or bath could use an update but you don’t want to go for a full renovation, consider some key changes to achieving a big impact with minimal effort. Quartz countertops have been taking over in the popularity department when compared to granite, but both materials are a significant step above laminate counters; and both offer great benefits for any kitchen or bathroom update. Durability. Quartz countertops are quite durable, standing up to the test of time when it comes to repelling stains, damage and burns. Quartz is also easy to maintain. A quick wash with soap and water will keep your quartz counters looking new. Granite is also durable but takes careful attention to maintain. Granite can get scratched and is an absorbing material which can lead to stains; an annual sealing coat is necessary to extend the life of granite countertops. Environmentally friendly. For countertops, ground quartz stone is used with a combination of pigments, polymers and resins. With this process there’s less energy used in the making of quartz, and delivery of these counters. There’s also an American based company which makes quartz counters, while most granite is imported, extending the energy use to get this product to market. The long-lasting durability of both materials does in the end equate with these counters being considered as a sustainable material- one installed there’s not likely a need to replace. Cost/Return on Investment. 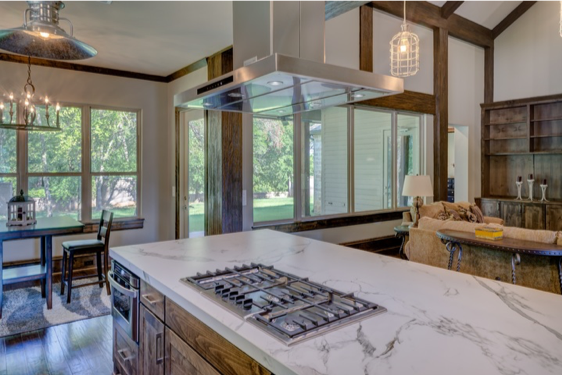 If you’re looking for a luxury-quality result with your new countertops, quartz is more likely to cost less than high-end granite as prices have come down on the natural stone option of granite over the last few years. However, imported, top-quality granite can cost more. Regardless of the material you choose both options have a solid return on investment, especially when it’s time to sell your house. Many homebuyers prefer a stone-based counter over laminate options. Ultimately, the decision of quartz vs granite countertops for your kitchen or bath comes down to personal preference. Find out more about Quartz vs Granite with this article by CountertopInvestigator.com. Whether you are buying or selling a home, you want it to be a stress-free and easy process. Work with a local, experienced Realtor® so you can buy or sell with confidence. The Driscoll Properties Team is ready to put our expertise to work for you. Learn more at our website, DriscollProperty.com, then contact the Driscoll Properties Team at 847-533-6786 to help you discover the home of your dreams.